Coding Robots’ Video Mémoires 1.0 is a journal program with a basic set of features to helps track your video entries on a daily basis. 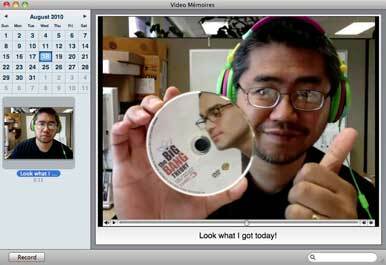 Video Mémoires works with your Mac’s built-in iSight or attached Webcam. When you’re ready to record a journal entry, you simply press the Record button. The program gives you a three-second countdown before it starts recording so you can get ready. When you’re done, press the Done button, and Video Mémoires saves the video under the day’s date, which is Video Mémoires key feature. In the software’s main interface (it looks a lot like the developer’s Mémoires journal software), there is a calendar on the upper left side. Click on a date, and you see that day’s associated videos listed below the calendar, and you can play back any of the videos listed. Video Mémoires features are minimal. You can add titles to your videos, and the program has a search field that bases its results on those titles. Many of the tools found under the Edit menu (such as a spelling and grammar check, make all upper case, or the ability to have the computer read aloud what’s written) apply only to the titles. You can also delete video entries. If you want to export a video, all you have to do is click and drag the video from its listing under the calendar to your desktop or other folder. On my 2.8GHz Core 2 Duo iMac, Video Mémoires recorded videos at 640-by-480 resolution, and saved them in H.264 format. Video Mémoires stores recordings in ~/Library/Application Support/Video Mémoires/Records, which is stored on your main hard drive. I imagine that over time, this folder would start to get very big with your saved videos and take up valuable hard drive space. Hopefully, future versions of Video Mémoires will allow you to designate where you want to save videos, like on an external hard drive. There are two more features I do hope to see in future releases. The first is the ability to import your own videos. The way Video Mémoires is set up now, you’re limited to recording through your Webcam, which, actually, keeps the software true to the idea of it being used as a daily video journal. But for those times you can’t be in front of your Webcam (say, while on a trip), it would be nice to be able to import video. The other feature I’d like is an ability to append written notes to a clip. This would help with the search capability. For example, if you were successful in maintaining a video journal daily for a year, you’d have well over 300 videos in Video Mémoires’ library, and searching those videos only through the title field isn’t going to help you find what you are looking for. This is version 1.0 of the software, and while Video Mémoires is a very basic program, for me it ran without any problems. It has a good premise, and if all you want is to be able to easily sit and record a daily journal and be able to quickly access past entries, Video Mémoires can do the job.